It is a fortunate, and probably well-funded, school or college that can truly call itself 'e-confident'. From the perspective of one that hasn't yet achieved IT nirvana, Malcolm Trobe outlines the issues he sees facing secondary education. Whenever faced with decisions on ICT strategy or on hardware and software purchases, there has always appeared to be several answers to each question I ask. At least back in the early 1980s, it was as simple as "Do we purchase a Commodore Pet or a RM 380Z?" There are now so many strands to developing ICT strategy and implementation that schools need a sophisticated process of evaluating the possibilities just to keep up. ICT is an area full of 'experts' and 'interested amateurs' whose major contribution, I have often found, is to give conflicting advice. This, together with the fact that there are so many providers of both software and hardware in the marketplace, makes it extremely challenging for any school to carry out an effective evaluation of all available products. Our track record of decisions in the ICT field is decidedly mixed. Ensuring that all teaching staff had their own laptop computers over five years ago, together with an inset programme to develop staff ICT skills, really moved us on very quickly. The decision to buy 'aver keys' so that we could put the computer screen images onto a TV set was semi-successful for all of a year before it was overtaken by the arrival of the digital projector (admittedly at far greater expense). Keen to avoid future errors of this nature I now have a new 'best friend' in the Becta website. The site is well worth an extended visit from school and college leaders, and it is one that all subject leaders should be encouraged to review regularly. It is now nearly a year since the Becta conference that was intended to develop a common approach to information and communication technology. As a result we now have a new self-review framework for school ICT. Available on the Becta website, this is certainly the most comprehensive aid that I have seen and is already proving to be extremely helpful. The process of completing a self-evaluation matrix against a set of levelled statements has been useful in measuring where the school is against a benchmark. 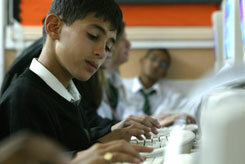 It also enables us to plan our way through the many strands of ICT. Once completed, the matrix leads to an action plan that comes complete with linked guidance and advice. There are a range of matrices that can be used with the nine areas that form the basis of Becta's self-review framework. The structure of the self-review is such that the process can be used flexibly depending on the institution's stage of development and its immediate ICT priorities. The use of electronic schemes of work linked with resources is one of the most useful developments I have seen in our school. Staff have found it extremely helpful in terms of lesson planning and organisation and it has had immediate impact on both teaching quality and student progress. It isn't rocket science and it takes a great deal of time to set up, at least initially, but it is tremendously effective. To observe a lesson in which the teacher can extract the 'learning goals' and 'success criteria' directly from the scheme of work and then move on to a range of resources either from the subject area's own resource bank or from a link to a website is not only highly professional, it is highly effective in terms of teaching. It is impressive to see a teacher, on finding a student struggling with a section of the work, go back into the scheme of work to find a different resource to assist that student. Three different 'homeworks' can be selected depending on the level of the student's work, with a worksheet printed from a local printer. If ever the DfES is looking for an example of personalised learning, this certainly fits the criteria. Initially the workload on staff was high as the schemes of work were constructed. However now that they are operational, the gain has been tremendous and the benefit to newly qualified teachers is beyond measure. The use of faculty support assistants to add new materials into the schemes of work is an effective way of reducing teacher workload. The selection of resources is, however, a key teacher task and is very time consuming, particularly the evaluation of websites and software packages. The use of Teachers Evaluating Educational Multimedia (TEEM) (www.teem.org.uk) has been particularly helpful here, as well as information available through Becta. The recent Becta report School Management Information Systems and Value for Money is an excellent document and its executive summary is well worth a read. The recommendations are clear and helpful and the DfES would be wise to act on them. There is always hope! The most important recommendation is "to establish a supplier-independent and open interoperability architecture to create the opportunity for improved interoperability at the school level". In layman's terms it means having an IT structure in which all software and hardware are compatible, regardless of the supplier. The report had earlier highlighted that how well various components work together is effectively dependent on the dominant supplier, which sets the detailed technical framework. As a school we have suffered significantly from disputes between suppliers of different parts of our information system, in the worst case leading to complete system failure. The sooner that interoperability architecture can be determined, the better. I also welcomed the recommendation to give more attention to effective MIS systems and institutional improvement. There is wide-spread agreement that effective use of data is a key strand in school improvement. I hope that those involved in the software development will listen to schools to find out exactly what their requirements are - rather than developing what they believe schools will want. The development of the Pupil Attainment Tracker (PAT) has been praised by some schools but we are continuing to find difficulties with this system, including downloading the school's data. As with a number of developments, perhaps an eagerness to get the system going meant it was released before all of the 'gremlins' were sorted. For instance, we are a pilot school for the post-16 value added study which involves the Learner Attainment Tracker (LAT), a post-16 version of PAT. This is due to be fully operational for next school year - we can only hope that the lessons from PAT are taken on board. When we were examining a revised reporting system, the fact that a whole range of software packages were reviewed enabled us to quickly check the online evaluations against our specifications. The recent white paper has indicated a government intention to have schools report to parents three times a year, albeit in less detail. There is no way in which we can complete our current reporting system three times a year even though it is partially electronic. So with further changes ahead, an up-to-date review of available software will be essential. Malmesbury School has developed an effective procurement process which includes posting requests for tenders on the internet. This has helped us to achieve value for money and provided effective benchmark cost levels. It will be interesting to see if the new DfES unit, The Centre for Procurement Performance (CPP) can produce advice that further improves school procurement practice. Hopefully it will provide processes that will enable schools to purchase at reduced costs. I have found that long-term financial planning for ICT has been difficult. Not knowing what the next technical development will be, nor its costs, together with the uncertainty of school funding levels has made longer-term planning nearly impossible. The arrival of three-year budgets should help, although we have yet to see how the ICT grant will be split between formula capital and the new standards development grant (SDG) and what restrictions may be placed on the expenditure. We are now at the stage of having given all our ICT equipment a life span and built into our planning the replacement costs at the end of their effective life. This has given us an uneven replacement budget which we intend to smooth by balancing over a three-year period. At least we now know the costs of maintaining our current provision. Planning for future changes is more difficult. Will my theory be correct that the use of interactive whiteboards will reduce the need to expand our computer provision? Of course as soon as I said it, someone appeared to ask if we were going to get Blackberries. Decisions, decisions! The decisions surrounding ICT will not get easier or less complicated for schools and colleges - much the opposite, I suspect. And the goalposts for achieving 'e-confident' status will not stand still waiting for institutions to catch up. However, if we as leaders can identify the initiatives that actually impact on teaching and learning and make schools and colleges more effective, and find a few key experts to help point the way, we will keep moving in the right direction. Malcolm Trobe is SHA vice-president and head of Malmesbury School, an 11-18 comprehensive in Wiltshire. Malcolm Trobe will be presenting at the BETT Show on Wednesday, 11 January at 3.15pm as part of the Leadership Speakers programme. His talk, concentrating on IT issues and solutions for secondary schools, is free and open to all. BETT will be the association's first public function after changing the name to the Association of School and College Leaders (ASCL). To help us celebrate, join us on the stand (number Z88) for a glass of wine and hors d'oeuvres between noon and 3pm each day of the show. We will also be launching the new ASCL website at the show.